A Weekly Advocacy Message from Mary Woolley: Breakthrough year? During his State of the Union address Tuesday, President Obama acknowledged the important role federally funded research plays in maintaining our global competitive edge and referenced the harm done to basic science by sequestration. Using the example of vaccines, he highlighted the importance of applied research, not only for our health but for the strength of our economy. See my statement about the address here. For the president to succeed in achieving a “breakthrough year for America” — a theme in his address that he is repeating in appearances across the nation — we urge him to put science and innovation at the forefront. I emphasized this in a letter we sent to him today. During the State of the Union Congressional Debrief sponsored by The Atlantic and National Journal, I asked Rep. Diana DeGette (D-CO-01) whether Congress would work with the president to undo the damage done to basic research. She said that she and others are working in a bipartisan way to assure that “America is the top nation for research in the world.” In an effort to combat the underfunding and underappreciation for federally funded science, our award-winning voter education initiative is launching shortly — “Ask Your Candidates! Is Medical Progress a Priority?” It is critical that we all ask congressional candidates their views about assuring medical progress. I encourage you to participate in this important campaign as we enter the primary and then general election season. Please join me in extending hearty congratulations to Research!America Chair and former Congressman John Edward Porter, who will receive the National Academy of Sciences’ most prestigious award, the Public Welfare Medal, at a ceremony this spring. 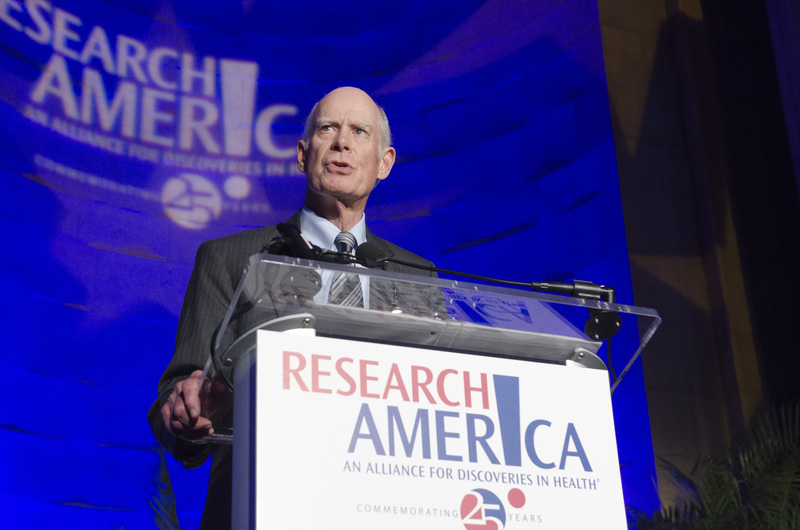 This award, rarely given to a non-scientist, recognizes John for decades of advocacy on behalf of medical research and salutes his many accomplishments, including leadership in the Congress for medical and all scientific research, resulting in increased federal support of our nation’s science agencies. He continues his leadership for science today! Just because you’re not in Washington, DC doesn’t mean you can’t still watch the Rally for Medical Research! Cokie Roberts of National Public Radio will emcee the event featuring members of Congress, cancer survivors like actress Maura Tierney (ER, NewsRadio), leaders from the scientific community including NIH Director Francis Collins, MD, PhD, and Research!America Chair, Hon. John Edward Porter. Take a moment and contact your Congressperson and Senators today, tell them to make medical research a higher national priority! Follow updates from the Rally on Twitter via @ResearchAmerica or #RallyMedRes. Sequestration will have a devastating impact on biomedical research and public health in the U.S. Learn more about the effects of sequestration — 10 years of across-the-board spending cuts for federal agencies including the National Institutes of Health, the Centers for Disease Control and Prevention, the Food and Drug Administration, and the National Science Foundation — on our website. We encourage you to use this information as you continue to advocate for medical research and join us as we fight to reverse sequestration. The Honorable John Edward Porter, chair of Research!America, sat down recently with Kellye Lynn of “Comcast Newsmakers” to discuss sequestration and why such cuts are detrimental to medical innovation. Click on the image below to watch the interview. Alexandria, Va.–January 9, 2013– America Speaks, Volume 13, a compilation of public opinion polls commissioned by Research!America, features timely data about Americans’ views on issues related to biomedical and health research. A majority of Americans (72%) say the new Congress and the President should take action to expand medical research within the first 100 days of the 113th Congress. Public support for increased government spending on medical research holds particular relevance as Congress considers whether to further delay, eliminate or permit “sequestration,” a budget cutting process that – if it moves forward – would mean drastic cuts in funding for medical research. Most Americans believe accelerated investments in medical research should be a priority, yet nearly 60% say elected officials in Washington are not paying close attention to combating the many deadly diseases that afflict Americans. An overwhelming majority of Americans (83%) also believe that investing in medical innovation has a role in creating jobs and fueling the economy. When asked about stagnant federal funding levels for research and the impact to science and technology, a wide majority (85%) said they were concerned. Americans also expressed concerns about U.S. global competitiveness in the near future. Less than half (41%) believe the U.S. will be the world leader in science and technology in the year 2020. In addition, almost half (48%) do not believe the U.S. has the best health care system in the world. Twenty years ago, AIDS ranked as the number-one health concern among Americans. Since then, research has saved countless lives and continues to drive progress. The number one health concern in 2012 was the cost of health care. 78% of Americans believe that it is important that the U.S. work to improve health globally through research and innovation. 70% of Americans believe that the government should encourage science, technology, mathematics and engineering (STEM) careers. Nearly half (48%) believe government investment in health research for military veterans and service members is not enough. 66% of Americans are willing to share personal health information to advance medical research if appropriate privacy protections were used. 75% say it’s important to conduct research to eliminate health disparities. Only 1 in 5 (19%) know research is conducted in every state. Online polls are conducted with a sample size of 800-1,052 adults (age 18+) and a maximum theoretical sampling error of +/- 3.2%. Data are demographically representative of adult U.S. residents. Polling in this publication was conducted by Zogby Analytics and Charlton Research Company. With a stellar team of advocates from across the research community, we have been blitzing Capitol Hill this week with our message that we need cures, not cuts. Research!America and our partners have participated in more than 60 meetings with Members of Congress, including key leadership and their staff. My thanks to the 140+ groups that signed on to our community letter to congressional leadership. Many partners have activated their grassroots to join the call Congress day, and there is still time to join the In-District Drop-In day (today) and a social media push on Friday. We also encourage you to keep up the drumbeat with emails and phone calls to Hill offices. Beltway media have taken notice of our ads and the coordinated activity, with articles appearing in The Hill and National Journal. Based on our meetings this week, the message is definitely getting through that across-the-board cuts or more stringent caps on discretionary spending would hurt our nation far more than help it. But it was also clear that continued, outspoken advocacy is crucial. No option is off the table, and that means we must keep making the case. Staffers told us that providing concrete examples to illustrate what’s at stake is crucial, and no community is better equipped to drive the point home than ours. We saw that yesterday, when, for example, leaders of the Society for Neuroscience gave concrete examples of research at risk, and when advocates from the Parkinson’s Action Network who are living with this incredibly challenging illness described what stalled progress means for them. I am certain – 100% certain – that their advocacy influenced influential people. The need for many more of us to engage was the message in the lead editorial in Science I co-authored with Research!America Board member and CEO of AAAS, Dr. Alan Leshner. In the editorial, we urge scientists not to stand back, but to speak up for research and make it clear to Congress that “No Science = No Growth,” quoting the words of former NSF Director Neal Lane. Research!America Chair The Hon. John Porter penned a letter to the editor expanding on Lane’s recent op-ed in The New York Times, reminding readers that research dollars are distributed based on peer review to every state and nearly every congressional district in the country. He calls on the lame-duck Congress to overcome partisan divides and step up now to prioritize research. 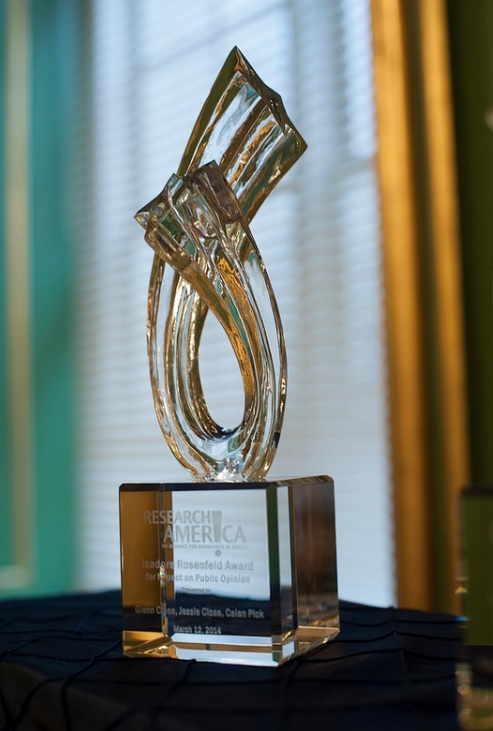 This afternoon, we are holding our post-election forum and award ceremony for the 2012 Garfield Economic Impact Award at AAAS. We’ll hear from Research!America Chair John Porter, Congressman Mfume, Dr. Mark McClellan and Matthew Cooper of the National Journal Daily. We will be reviewing what we learned about areas of common ground in the Congress from responses to our voter education initiative, Your Candidates-Your Health, and discussing advocacy strategies going forward. View full event details here and join us if you are in DC. I was saddened to learn of the death of former Congressman Joe Early (D-MA). Rep. Early served for nearly 20 years, championing funding for NIH on the Labor, Health and Human Services appropriations subcommittee, and at every other conceivable opportunity. He was an ardent supporter of Research!America in its start-up phase. We extend our sympathies to his family on their, and the nation’s, great loss. Monday next week is Public Health Thank You Day, our annual salute to the unsung heroes of public health who keep us safe in so many ways. Please take a minute on Monday of Thanksgiving Week to do a shout-out to people you know who are making a big difference for health. Check out this link for details. And do enjoy Thanksgiving. My letters will resume on Thursday, November 29.